VICTORIA, BC – Phillips Brewing has announced the return of a summer seasonal brand that had a popular inaugural run last year. This is no mirage… Solaris returns to help you crack the code of the summer heat and unlock the secrets of the Beeramid. This refreshing brew arrives just in time to celebrate the return of longer and warmer days. 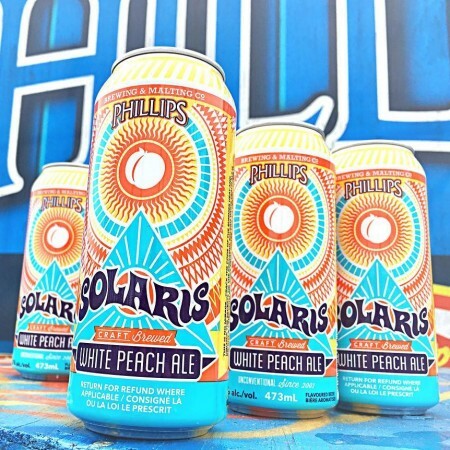 Solaris White Peach Ale is brewed with wheat and unfiltered to be hazy for your summertime lazy. It’s bright and crisp with big juicy fruit notes that are sure to reward all flavour seekers. Solaris will be available in 473 ml cans at the Phillips brewery store and select private liquor stores in BC. It will also be available to sample on draught during a launch event at the Phillips brewery this Thursday May 4th from 4:00 to 6:00 PM. « Alley Kat Back Alley Brews Series Continues with Schank’d It!